A couple of weeks back, and a few times since, I’ve found myself talking or writing about brass screw installation and how to do it without problems, so I thought I’d post a few tips and tricks to refresh the idea if you’ve seen this in the past, or bring it to your attention if you have yet to read this anywhere. Brass screws are softer than steel screws (Duh!). But I’ve seen steel screws – especially screws sold at home centers – break many times, so keep that in mind, too. The proper method to install brass screws is to drill and countersink your holes using the proper devices. I find that’s easy to follow if you’re driving 3/4″ or longer screws. Shorter screws, for me, present more of a problem, especially when driving screws for hinges. What I do is locate the center of my hole using an awl, such as a birdcage awl from Czeck Edge. Then I drive a steel screw of a matching size and with similar threads. I then pull the steel screw and turn in the brass screw. But what do you do if your brass screw breaks as you tighten, or over tighten? Then you need a screw extractor as shown at the right. This is simply a tube that has saw-like teeth cut at the ends. You center the tool over your broken screw, and with the extractor chucked in your drill, spin the tool until it’s below the screw depth. When you break out the plug – this is basically using a plug cutter – the broken screw pops out. While this is actually a plug cutter, the biggest difference is that the extractor is correctly sized to an outside diameter which can easily be filled with a dowel, or other cut plugs. There is something strange when using a screw extractor. The tool is meant to be spun in your drill while the drill is set in reverse. If after a few seconds your extractor is not going into the wood, change the spin direction. Another interesting tidbit is that these extractors are difficult to hold in position as you begin the cut. If you have an area that you don’t want to hack up as the extractor wriggles around before it bits into the wood, there is a method of work that saves your surface. As I wrote above, screw extractors are sized to be easily replaced with dowels. To make that happen, they need to be sized to standard diameters, which means you can also drill a hole the exact diameter using a drill bit. 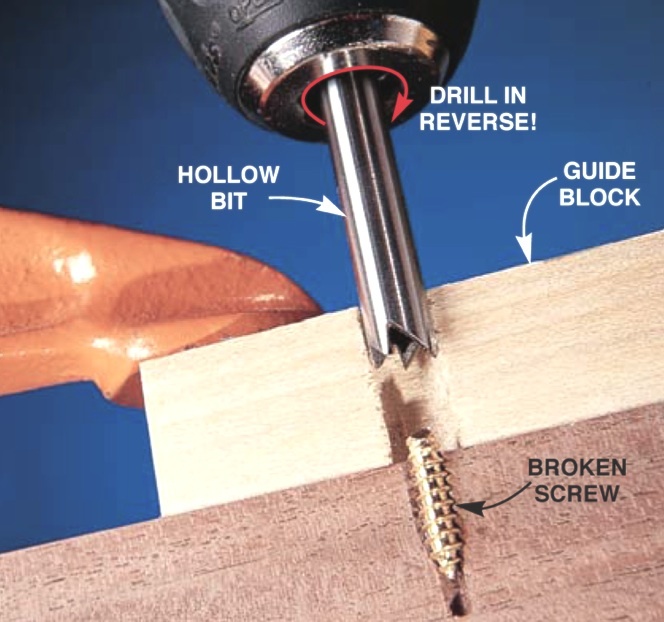 If you drill a hole with a matching diameter through a scrap, then locate that hole perfectly over your broken screw, the hole guides the extractor. No marred surfaces. The above photo was pulled from an issue of American Woodworker magazine. You should expect to hear about and read about many new things with American Woodworker in the coming months and years. Why? If you haven’t yet heard, F+W Media – owner of Popular Woodworking Magazine of which I am currently the managing editor has purchased the company which owns and operates American Woodworker. You can read a press release here, if you’re so inclined to do so. 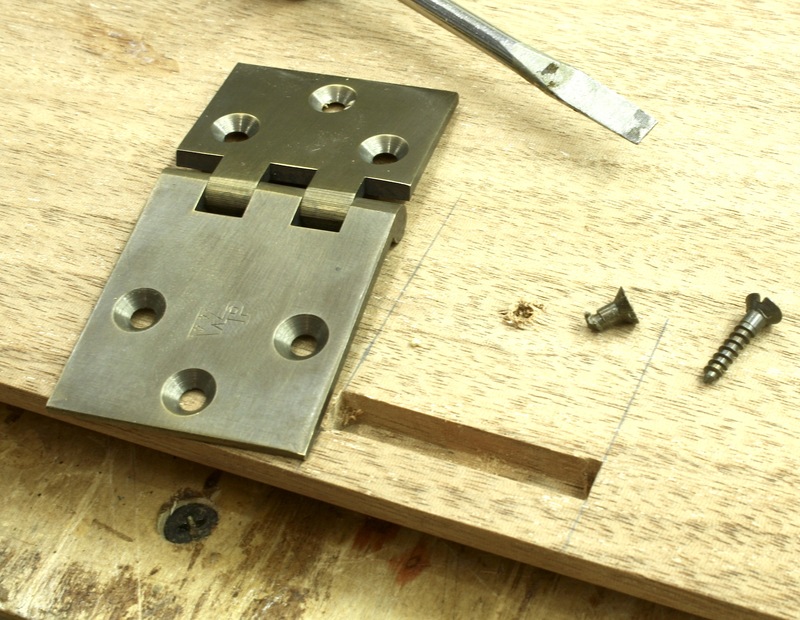 I don’t use wood screws for hinge and other hardware installation–I use brass machine screws. I was introduced to this idea from a LV news bulletin about 5 years ago. What you do is drill and tap the hole to match the screw, for smaller items I use a 4-40 tap, then I use fh slotted brass machine screws. I find this to be an extremely good method, the holding power of machine screws–even in softwood is just as good ore even better than wood screws. And since the hole is tapped, the odds of the screw breaking are very low. If you have a drill bit the size of the hole the extractor made. Then find a metal tube that just fits over the drill bit. Grind a few teeth in the end of the tubing and use it to create plug. I find that a hobby/train store by me sells all different sizes of brass tubing. You don’t need the tube to slide over the bit. 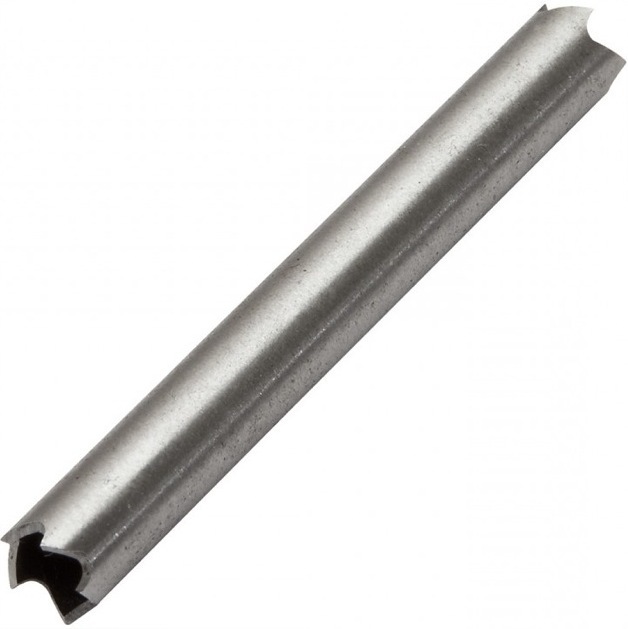 You need a tube that has an outside diameter that equals your drill bit diameter. We are saying the same thing? I use my drill bit to measure the plug. I had the same problem months ago on a captains table and used the same method to do the repair. A simpler method is to tighten the chuck of your battery drill directly around the stump of the screw. Put the drill into reverse and simply wind the screw out. No damage to the wood. Quick and easy.